A Quonset hut is a lightweight prefabricated structure of corrugated galvanised steel having a semicircular cross section. The design was based on the Nissen hut developed by the British during World War I. The name comes from their site of first manufacture, Quonset Point, at the Davisville Naval Construction Battalion Center in Davisville. Davisville was a village located within the town of North Kingstown, Rhode Island. In 1941 the United States Navy needed an all-purpose, lightweight building that could be shipped anywhere and assembled without skilled labor. The George A. Fuller construction company was selected to manufacture them. The first was produced within 60 days of contract award. The original design was a 16 ft � 36 ft (5 � 11 m) structure framed with steel members with an 8 ft (2.4 m) radius. The sides were corrugated steel sheets. The two ends were covered with plywood, which had doors and windows. The interior was insulated and had pressed wood lining and a wood floor. The building could be placed on concrete, on pilings, or directly on the ground with a wood floor. The most common design created a standard size of 20 ft � 48 ft (6 m � 15 m) with 10 ft (3 m) radius, allowing 720 square feet (67 m�) of usable floor space, with optional four-foot overhangs at each end for protection of entrances from the weather. Other sizes were developed, including 20 ft � 40 ft (6 m � 12 m) and 40 ft � 100 ft (12 m � 30 m) warehouse models. The flexible interior space was open, allowing for use as barracks, latrines, offices, medical and dental offices, isolation wards, housing, and bakeries. SteelMaster Building Systems' corrugated arch style steel buildings are of the Quonset design. SettlMaster has dealers in all fifty states. In the late 1970�s, SteelMaster engineered and designed a new, stronger structure based the historic designs of the Quonset Hut. SteelMaster evolved the Quonset into a new structure that combines the architectural strength of the arch along with 20th century technology which allows the buildings to be designed and engineered to handle all types of climates and conditions. The Quonset style building was nicknamed the �Q-Model� to honor the historical significance of these structures over time. And over the years, SteelMaster continued to develop the original Quonset design and engineering to meet the same primary goal: provide all-purpose Prefabricated Steel Buildings and Roofing Structures that can be shipped anywhere in the world and can be constructed quickly and easily. Powerbilt steel arch buildings were the first of their kind to receive Government Services Administration (GS07F0319K) approval. Powerbilt steel arch buildings have satisfied requirements for all branches of the US armed services including: the Air Force, Army, Coast Guard, Marines and Navy as well as designing buildings for the Federal Prison System. Powerbilt steel arch buildings are delivered factory direct avoiding the middleman and increasing the savings to the customer. All Powerbilt metal buildings are shipped with an easy to follow assembly manual and can be erected with as few as four people in as little as three days. Over 70% of the simple bolt-together construction is done on the ground and requires no special tools or equipment. Most customers are able to erect their buildings themselves. Powerbilt steel arch buildings are 100% American made and manufactured in Pittsburgh, Pennsylvania from the highest quality US commercial steel available. They carry an American manufacturer's warranty. Keep America strong buy American! Powerbilt Q Series arch style steel buildings are otherwise known as Quonset huts. These classic Q Series steel sheds provide unbelievable strength as the rounded shape of their corrugated arch is one of the strongest structures in architecture; they have been proven to withstand hurricanes, tornadoes, earthquakes, and heavy snow. Without beams or trusses, Powerbilt Q Series steel sheds offer 100 percent useable space and are ideal for uses as diverse as grain storage, backyard workshops, and airplane hangars. Model sizes range from 20 to 80 feet in width and come in unlimited lengths. 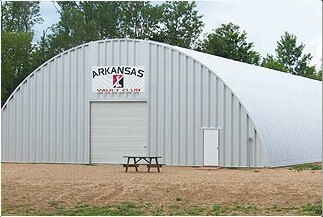 The P Series of steel sheds offers a more traditional building style with straight sidewalls and arched roof and the strength and durability of arch steel sheds. This model optimizes useable space by raising the arch to above the sidewalls, providing you with plenty of room to house a backyard workshop or garage or even a guest cottage. Powerbilt P Series steel sheds come in unlimited lengths and either 14 or 30 foot widths. Available in three colors, our buildings can be customized to match the exterior of your home. The A Series steel shed enjoys the same tested engineering as our P Series steel sheds. The appeal of this shed style lies in its 4 to12 pitch roof, which offers perfect protection for your workshop, storage, or garage space in high wind and snow areas. The A Series of steel shed is available in three different colors and in 20 to 40 foot widths.